Interstate 664 in Virginia is a western bypass and alternate route for the Virginia Tidewater and the Hampton/Newport News metropolitan area. The interstate begins at the eastern terminus of Interstate 64 and the western terminus of Interstate 264 with a northerly orientation toward the James River. The freeway crosses the Monitor-Merrimac Memorial Bridge Tunnel before entering Newport News and Hampton, where it reunites with I-64. Interstate 664 utilizes sequential based exit numbers. The freeway represents the western half of the Hampton Roads Beltway system; the eastern half is Interstate 64. Signs and trailblazers are posted on the beltway using inner and outer directions. A seven mile section of Interstate 664, from Chesapeake north through Virginia 35 (Exit 8) in Suffolk, opened to traffic following a ribbon cutting ceremony held on January 17, 1992. The freeway cost $139 million.10 This section tied into the bridge-tunnel complex when it opened to traffic at 12:01 AM on April 30, 1992. A formal dedication of the Monitor Merrimack Memorial Bridge Tunnel was held the previous day and led by Gov. L. Douglas Wilder, completing the $400 million crossing.12,13 Interstate 664 was not approved by the AASHTO Special Committee on Route Numbering until June 13, 1992. Virginia 134 along the Newport News Connector, predecessor to Interstate 664, in 1969. 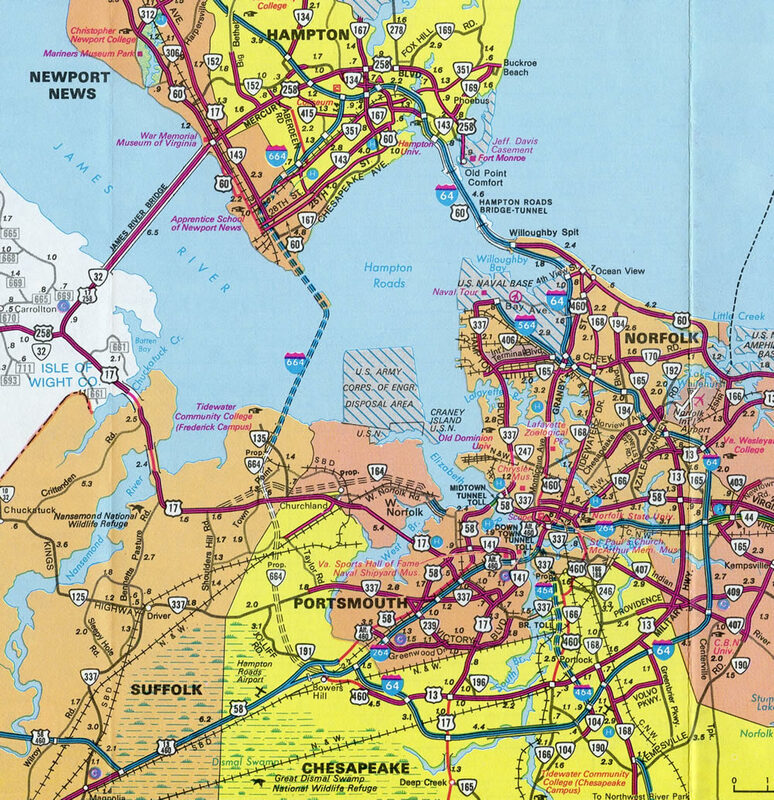 The Newport News Connector formed a controlled access route southwest from I-64 west along what is now I-664 to Aberdeen Road, and along Aberdeen Road to Virginia 143 (Victoria Boulevard). 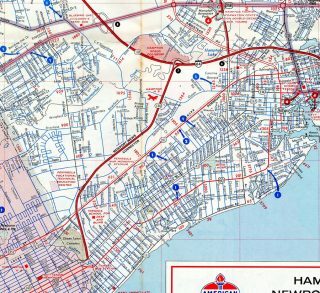 It was assigned VA 134 between 1967 and 1971. Interstate 664 ended at the split diamond interchange with Chestnut Street from the north until 1987. Virginia Official Highway Maps showed the southern extent of Interstate 664 as VA 664 through part of the 1980s. 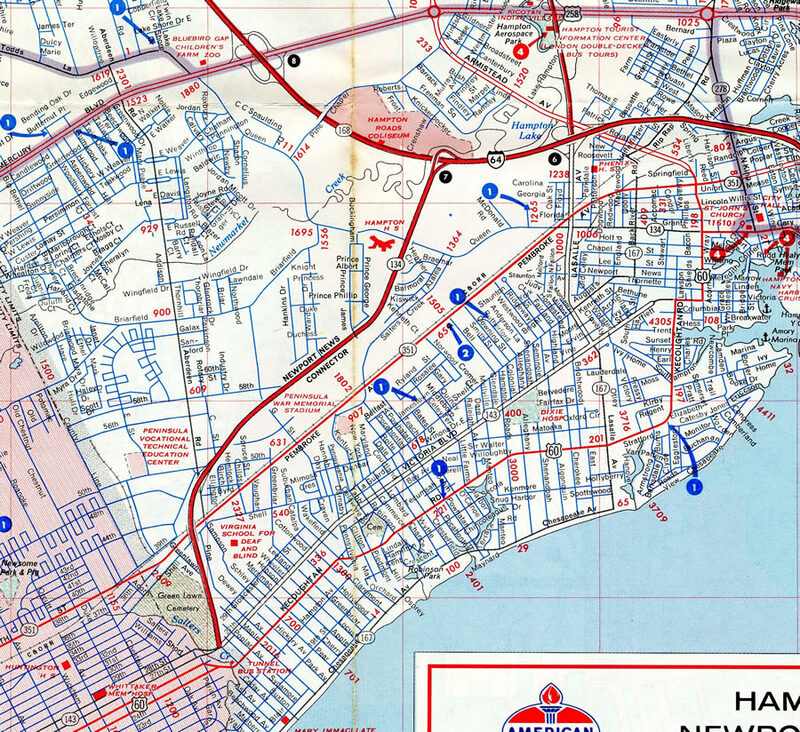 The 1986 map was the first to show the proposed alignment south to Bowers Hill. Passing within the diamond interchange (Exit 2) at Powhatan Parkway, Interstate 664 veers northward toward Interstate 64. Photo taken 10/12/14. Sound walls line Interstate 664 as it approaches the Virginia 415 underpass. The directional T interchange with I-64 lies one half mile ahead in a wetlands area along Newmarket Creek. Photo taken 10/12/14. A two lane flyover shuttles motorists onto Interstate 64 west toward Williamsburg and Richmond. The eastbound ramp references Downtown Hampton in place of I-64. The eastbound freeway circles southward to leave Hampton via the Hampton Roads Bridge Tunnel into Norfolk. Photo taken 10/12/14. This set of signs posted a half mile ahead of Exits 1A/B with Interstate 64 was replaced by 2011. The unusual placement of the last reassurance marker for I-664 north was retained. Photo taken 03/01. A greenout was added at some time on the Exit 1B panel for Interstate 64 east referencing Downtown Hampton. This element of sign design was retained when both panels were carbon copied by 2011. Photo taken 03/01. Traveling southeast from U.S. 258, the first sign for Interstate 664 (Exit 264) appears on I-64 east. I-664 is the recommended route for vacationers destined to the Outer Banks of North Carolina via the Chesapeake Expressway (Virginia 168) south. Photo taken 10/12/14. Interstate 64 leads east by Hampton Coliseum on the half mile approach to Interstate 664 south. A two-lane ramp departs for I-664 southwest to Newport News and the Monitor-Merrimac Memorial Bridge Tunnel. Photo taken 10/12/14. Interstate 64 enters the Hampton Roads Beltway system beyond the directional T interchange (Exit 264) with Interstate 664 south. I-664 reaches Downtown Hampton in 4.5 miles. Photo taken 10/12/14. This set of signs was replaced by 2007 to show the two-lane off-ramp (Exit 264) for I-664. The La Salle Avenue overhead once displayed a VA 167 shield. Photo taken 03/01. Interstate 64 winds west across Virginia 134 (Armistead Avenue) and LaSalle Avenue to run along Newmarket Creek to Interstate 664 south. Photo taken 10/12/14. Merging traffic from Virginia 134 (Armistead Avenue) forms an auxiliary lane west to Exit 264. Interstate 64 swings through northern reaches of Newport News beyond here while I-664 leads motorists south to Suffolk. Photo taken 10/12/14. Interstate 664 south swings east at U.S. 13-58-460 and spans a Seaboard Coast Railroad line ahead of the three-wye interchange (Exits 15A/B) with Interstates 264 east and 64 outer. Photo taken 07/28/13. U.S. 13 north & 460 east part ways with Hampton Roads Beltway as the three lanes of Interstate 664 prepare to separate for I-264 east into Portsmouth and I-64 outer southeast to Chesapeake. Photo taken 07/28/13. Interstate 664 ends as the Hampton Roads Beltway turns southeast along I-64 to encircle Portsmouth and Norfolk to Virginia Beach. I-264 runs east from here seven miles to Downtown Portsmouth via Exit 15A. Photo taken 07/28/13. An end shield appears for I-664 south on the connection to I-264 east. Interstate 264 enters the city of Portsmouth prior to Exit 2 and the city of Norfolk by Exit 8. Photo taken 07/28/13. End Interstate 664 on the Interstate 64 outer ramp. Interstate 64 shields posted along the Inner/Outer portion are not signed with a cardinal direction banner. Photo taken by Aaron Porter (12/29/01). This set of signs posted along I-664 south at the split with U.S. 13 north & 460 east was replaced by 2011. U.S. 13 & 460 follow Military Highway east for 6.8 miles to Interstate 464. Photo taken by Jonathan Lebowitz (08/02). Former overheads posted at the I-664 separation into ramps for I-264 east (Exit 15A) and I-64 outer (Exit 15B). The West cardinal direction was greened out on the Interstate 64 panel. Photo taken by Jonathan Lebowitz (08/02). End shield assembly posted on transition ramp from Interstate 64 inner onto Interstate 664 north. Photo taken by Tony Payne (04/00). Westbound Interstate 264 at the split between Interstate 64 Outer and Interstate 664 North. U.S. 13-58-460 tie into Interstate 664 nearby at Bowers Hill. Traffic taking the Hampton Roads Beltway north will reach Newport News in 14.7 miles. Photo taken 12/17/01. “Dredging Will Begin For I-664 Project.” Richmond Times-Dispatch, February 13, 1986. “STATE TO GET $149.7 MILLION TO COMPLETE I-664 TUNNEL.” Richmond Times-Dispatch, May 7, 1986. “I-664 TUNNEL CONTRACT IS MOST EXPENSIVE EVER.” Richmond Times-Dispatch, August 22, 1986. 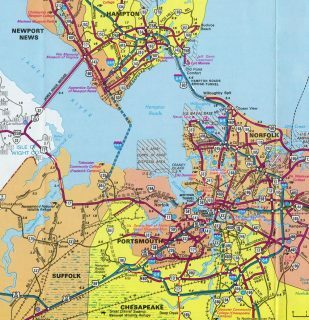 “NEWPORT NEWS LINK OPENED.” Richmond Times-Dispatch, September 17, 1987. “FIRST TUNNEL SEGMENT PLACED IN I-664 PROJECT.” Richmond Times-Dispatch, March 31, 1988. “TUNNEL’S LAST TUBE IN PLACE.” Richmond Times-Dispatch, June 28, 1989. “TUNNEL PROJECT ALMOST COMPLETE.” Richmond Times-Dispatch, August 6, 1990. “I-664 SCHEDULED TO OPEN IN APRIL.” Richmond Times-Dispatch, June 5, 1991. “I-64 TO BE WIDENED WEST OF GASKINS – BRIDGE IS NAMED.” Richmond Times-Dispatch, September 20, 1991. “7-MILE STRETCH OF INTERSTATE 664 OPENS IN SUFFOLK.” Richmond Times-Dispatch, January 18, 1992. “$400 MILLION BRIDGE-TUNNEL IS AGENCY’S PRIDE AND JOY.” Richmond Times-Dispatch, April 25, 1992. “$I-664 BRIDGE-TUNNEL OPENED TO TRAFFIC – SPAN FINISHES HIGHWAY LINK.” Richmond Times-Dispatch, April 30, 1992. “ON YOUR MARK, GET SET, CROSS!” Richmond Times-Dispatch, April 30, 1992. “I-664 SECTION IS SET TO OPEN NEXT MONTH.” Richmond Times-Dispatch, August 22, 1987. Interstate 664 History, Roads to the Future web site (Scott Kozel). Page updated January 3, 2016.